Become AMWA Participant only at $45! AMWA Interview with Har Dam Rawan Hai Zindagi. 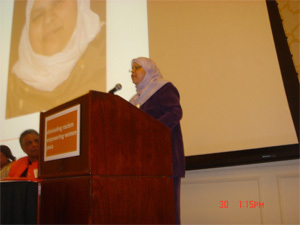 Left:The American Muslim Women’s Association President, Mrs. Fozia Khan, accepts Award. The Sojourner Truth Award is presented to a woman who has exemplified outstanding community service and whose life exemplifies the bold and tenacious spirit of Sojourner Truth, a woman dedicated to women’s rights, human dignity and racial justice. This award celebrates her spirit of the strength, courage and commitment. Fozia Khan is a dedicated community activist who reaches out across Westchester communities to build bridges among interfaith groups and organizations. She is the current President of the American Muslim Women’s Association, which works to promote Islam through various educational, social and intellectual forums. Fozia gives presentations at local public schools and teaches at the Saturday Islamic school in Mount Kisco, New York where she is also vice president. In addition, Ms. Khan is an active volunteer who seems to be everywhere. She participates with the American Red Cross in White Plains and Armonk; the Hartsdale/Scarsdale Women’s Interfaith Council; the North Castle Citizen’s Corps Council; The Inter-religious Council of New Rochelle; and the Coalition for Mutual Respect. You can often find her in local soup kitchens or delivering meals to needy residents in New Rochelle.